Spanish Prayer Card Laminated 5 PK : Mary, Refuge of Holy Love Laminated with "Prayer to Mary, Refuge of Holy" on reverse side. 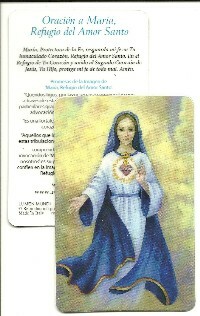 Image of Mary, Refuge of Holy Love with Prayer to Mary, Refuge of Holy Love on reverse side in Spanish. Duplicated from original painting.